Want to lose weight? Research shows green tea helps by boosting your metabolism to burn more fat. We’ll show you how you can use green tea for weight loss. Welcome to the Health and Fitness Experts video series. I’m Francis, and today we’re going to talk about green tea and weight loss. Losing weight with green tea has become a really hot topic, especially since Oprah started talking about it. But can you really lose weight by drinking green tea? And just how do you do it? Well, we’ve got the answers. So let’s jump in and take a quick look. First of all, the good news. You can really lose weight by drinking green tea. That’s because green tea contains a naturally occurring compound that will boost your metabolism and help your body to burn fat. The compound is called EGCG. And as a bonus, research has shown that not only will it help you lose weight, but it’s full of all kinds of other health benefits. So, how much weight can you expect to lose by drinking green tea? Well that’s the bad news. Green tea is not a miracle drink that’s going to make you instantly skinny. But you can expect to lose about one to two pounds each month. That’s not a lot, but it’s not bad just for switching what you drink. So how much green tea do you need to drink? Well research has shown that the magic number is about three or four cups of green tea each day. Now that may sound like a lot, but it’s really not that hard to do once you get into the habit. For example if you drink soda, try replacing one or two cans of soda with one or two cups of green tea every day. And if you’re a heavy coffee drinker, try replacing one or two cups of coffee with one or two cups of green tea. Once you get into the habbit, you’ll find that it’s really pretty easy to fit in three or four cups of green tea each day. And you’ll really enjoy the benefits. That’s it for this episode, but our Health and Fitness Experts website has much more information on how you can use green tea to lose weight. And you’ll also find tons of useful tips on diet, exercise and nutrition that will help keep you healthy and fit. Thanks for watching, and we’ll see you next time. Green tea boosts your metabolism to help you lose weight. You won’t get skinny overnight, but you’ll shed a few pounds. Plus, it’s full of life-extending health benefits! Want to lose weight? 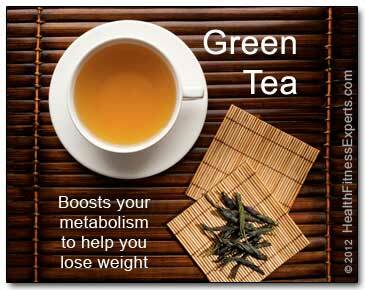 Research shows that green tea can help by boosting your metabolism to burn more fat. We’ll show you how you can use green tea for weight loss. Green tea has been a popular weight loss solution ever since Dr. Nicholas Perricone told viewers of the Oprah Winfrey Show that you could lose 10 pounds in six weeks simply by substituting the coffee you drink with green tea. Is that true? It’s mostly true. Medical research shows that green tea can actually help you lose weight! It just works a little more slowly than Dr. Perricone suggested. How Much Weight Can You Really Expect To Lose? How Much Green Tea Should You Drink? How Should You Prepare Your Green Tea? 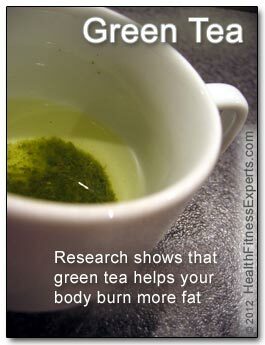 Boost the Fat Burn with Green Tea & Exercise! Is Green Tea Better than Black Tea or Coffee? Do Green Tea Extract Supplements Work, Too? If Dr. Perricone was exaggerating, what’s the real truth about green tea and weight loss? For starters, green tea has zero calories, which makes it a smart beverage choice. It’s much better than soft drinks or coffee with cream and sugar. So, how many pounds can you lose by simply drinking green tea for weight loss? The metabolism boost is only a temporary effect, and it’s not huge. While some studies have shown more dramatic results, a 2010 report by researchers at the University of Connecticut looked at fifteen previous studies and concluded that the average person’s green tea weight loss was about 3 pounds over a 12 week period. Each pound is 3,500 calories, so that’s about 1 pound a month, or a little more than 100 calories per day. That may not sound like much, but it adds up to about 12 pounds each year. Since the average person gains a few pounds per year after age 20, losing 12 pounds a year is actually pretty great! The amount of beneficial compounds in green tea can vary, depending on the tea. But most studies suggest that drinking 3 -4 cups of green tea per day is the right amount — that’s the typical amount that people drink in Asia. You shouldn’t go overboard and drink much more than 4 cups per day. Some research has suggested that too much green tea might increase liver toxicity, although a 2009 study by German researchers found no danger to your liver. But until more studies are done, stick to 4 cups a day or less. 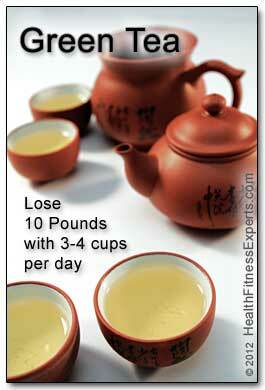 Lose about one pound per month by drinking three to four cups of green tea each day. You should also note that green tea contains caffeine — about half the amount of black tea and one quarter the amount of coffee. So if you have trouble sleeping, you should avoid green tea in the afternoon and evening. And note that decaffeinated green tea does not have the same fat burning effects as caffeinated tea. So you need to keep the caffeine! To maximize the fat burning potential and get the most health benefits out of your green tea, you should brew your tea fresh and steep it for at least 3 -5 minutes. And don’t add any sugar to your tea! Those empty calories will wipe out any weight loss benefits that you’ll get from your tea. Note that freshly brewed tea has the most benefits. Decaffeinated tea, instant tea, and ready-to-drink bottled tea drinks have less of the healthy antioxidants (catechins) that help you lose weight. And they are usually loaded with sugar. So, how does green tea work? It turns out that green tea contains high levels of naturally occurring compounds called antioxidant polyphenols. Scientists have focused on a particular polyphenol found in green tea: a catechin called epigallocatechin-3-gallate, or EGCG. The EGCG combined with the caffeine in green tea produces what scientists call diet-induced thermogenesis. This effect boosts your body temperature and your metabolism, forcing your body to work harder and burn calories to cool you down. The green tea ingredients trigger your body to release stored fat into your blood stream where it is converted to energy by your liver and muscles. Green tea essentially triggers your body to boost your metabolism, melt fat, and burn it. Awesome! EGCG does much more for you than just burn fat. It will lower your cholesterol, boost your memory, prevent the flu, and much more. Find out more in our article Health Benefits of Green Tea: Facts & Fictions. Boost the Fat Burn: Combine Green Tea With Exercise! It’s important that you don’t view green tea as a magic bullet that will make you skinny overnight. As we said, on its own, green tea will only help you lose about one pound per month. You also need to make sure that you are eating sensibly and exercising regularly. As a bonus, you’ll get even more fat burning results from green tea when you combine it with regular exercise. Studies have shown that drinking three to four cups of green tea per day will boost your exercise endurance by causing your body to burn fat instead of carbohydrates during your workouts. Burning the carbs stored in your muscles causes the buildup of lactic acid which leads to fatigue and sore muscles. But green tea causes your muscles to burn more fat instead of carbs, which delays your fatigue and increases your endurance. And, of course, you are burning and eliminating more fat with every workout! If you don’t like green tea, can you get the same benefit from other teas or coffee? Drinking green tea can help you lose 10 or more pounds each year. That’s much better than gaining a few pounds each year! All non-herbal tea comes from the same plant. But unlike oolong or black tea, green tea leaves are not fermented before they are dried. As a result, green tea has much higher concentrations of the catechins that provide weight loss and other benefits. So other teas aren’t nearly as beneficial as green tea. And coffee also doesn’t work. While some of the fat burning effects are caused by the caffeine in green tea, researchers found that its the combination of the catechins and the caffeine together that cause the weight loss effects. Swiss researchers looking at this issue concluded that “green tea has thermogenic properties… beyond that explained by its caffeine content.” Green tea extracts without caffeine did not work, and neither did caffeine alone. If you really don’t like green tea or if you don’t have time to brew it, you can actually get the same weight loss benefits from green tea extract supplements. A 2010 study by Oklahoma State University researchers found that both freshly brewed green tea and extract supplements provided the same body weight and BMI (body mass index) reductions. However, the researchers also found that some other green tea health benefits came only from the freshly brewed tea and not from the supplements. Research studies show that drinking green tea causes your body to burn fat. The Chinese have been drinking green tea for thousands of years. In recent years, it’s become popular all around the world and both eastern and western scientists have done a great deal of research on the health benefits of green tea, including numerous studies confirming that green tea really can help you lose weight. For example, the 2010 Oklahoma State study mentioned above looked at obese test subjects and concluded that drinking four cups of green tea or taking two extract supplements per day for 8 weeks resulted in “significantly decreased body weight and BMI,” averaging about 5.5 pounds per person. Looking at obese patients trying to lose weight with exercise, researchers in a 2009 Indiana study found that test subjects who took green tea catechins combined with caffeine (about equivalent to 4 cups of green tea per day) lost more weight than those who took only caffeine. And, the green tea subjects had larger reductions in their stomach fat. In one of the most cited studies, published in a 2005 issue of The American Journal of Clinical Nutrition, Japanese researchers studied 38 healthy men with varying weights and BMI’s, giving half of them regular oolong tea and half of them oolong tea with added green tea catechins. After 12 weeks, all the men experienced some weight loss, but the subjects who got the green tea catechins had about double the weight loss and double the decrease in BMI and waist circumference. The green tea extracts made a big difference. Finally, researchers working on the previously mentioned 2010 University of Connecticut study looked at fifteen prior studies that included 1,243 test subjects, and they saw “statistically significant reductions” in body weight, BMI, and waist circumference for subjects that either drank green tea or took supplements with the equivalent amount of green tea catechins and caffeine. Those researchers saw a reduction of about one pound per month. It should be noted that the UConn researchers thought that the weight loss results were not “clinically relevant” when compared to “pharmacologic weight-loss products on the market.” But we disagree. As we’ve said, you won’t get dramatic results from green tea. But it can be a very helpful part of any weight-loss plan. And considering the many other health benefits of green tea, losing one pound a month seems like a very nice bonus. Do you drink green tea? Have you used it to lose weight? Let us know by leaving a comment below! So, add green tea to your daily routine. If weight loss is your primary goal, you can go with green tea extract supplements. But since freshly brewed green tea also provides a long list of additional health benefits, we’d suggest skipping the pills and brewing yours fresh. Switching to zero-calorie green tea from other calorie-rich drinks is a double bonus — you eliminate calories in your diet while boosting your metabolism. And you’ll get all the other green tea health benefits, too! Journal of the American College of Nutrition. New York, NY: American College of Nutrition. Nutritional Sciences. Human Environmental Sciences. Oklahoma State University, OK, USA. The American Journal of Clinical Nutrition. Bethesda, MD: American Society of Clinical Nutrition. Department of Physiology. Faculty of Medicine. University of Geneva. Rockville, MD: American Society for Nutrition. Institute of Human Nutrition and Food Science. Christian-Albrechts-University. Germany. Micronutrient Information Center. Linus Pauling Institute. Oregon State University. Journal of Agricultural and Food Chemistry. 50.3 (30 Jan 2002): 565-70. Procter Department of Food Science. University of Leeds. United Kingdom. Provident Clinical Research. Bloomington, IN, USA. Health Care Products Research Laboratories No.1. Kao Corporation. Tokyo, Japan. University of Connecticut School of Pharmacy. Storrs, CT, USA. United States. Department of Agriculture. Agricultural Research Service. Nutrient Data Laboratory. USDA National Nutrient Database for Standard Reference, Release 24. Tempe, AZ: Weil Lifestyle, LLC. Please advise me, I want to reduce my weight by min:20kgs. Age:28, Height :172, Weight:90. Which one is the best brand of green tea in India? How to use green tea: day by day procedure including timing? (exp:BF,Lunch & dinner before and after). How many cups to take per day? You should drink 3 to 4 cups per day. It’s good to spread it out during the day so that you don’t get too much caffeine all at once. If the caffeine gives you trouble sleeping, then you should avoid green tea in the late afternoon and evening. Regarding meals, green tea can interfere with your absorption of iron. So you may want to avoid drinking it with meals. However, you can eliminate iron absorption problem by also eating or drinking something with vitamin C (like lemon or orange). Note that drinking green tea will only help you lose about 1 kilo per month. So, if you want to lose 20 kgs, then you will also need to increase your exercise and reduce the calories you eat. I don’t know which brands in India are best (I’m in the U.S.), but any quality brand that you enjoy should be fine. Is tea important for children? The health benefits of green tea would also benefit children. However, green tea also contains caffeine. While moderate amounts of caffeine are not usually harmful to children, it would be best for children to avoid it. Our advice: green tea is not important for children, and they may be better off avoiding it until they are older. Thank you for this extremely informative post. I’ve been looking to shed weight for about one week now, but I’m still puzzled about the place to begin. You just helped to set my priorities. Thank you. I waana become slim fast. How do i do that? …and how long do I have to take green tea? Will I become slim in 1 year? Your one year goal is a good one. It’s not healthy to lose weight too fast. Green tea will help you lose 1-2 pounds per month. If you want to lose more weight, you will also need to eat better and exercise more. Hi. I’m a 15 year old guy and I’m 215 lbs….. I just started drinking green tea. How long before I notice changes? You’ll lose about 1-2 pounds per month. If you really want to lose weight, you will also need to eat well and exercise! While drinking green tea, can we mix with lemon? Which will give more weight loss: only green tea or green tea + lemon? You’ll get the same weight loss results with our without lemon. So if you like lemon, it’s great to add it. Is it bad to drink green tea if you have low iron? And how much weight can you lose drink 3 cups a day for a week? You do need to be careful if you are iron deficient (anemic) because green tea can prevent your body from absorbing iron in the foods you eat. However, you can minimize this problem if drink your green tea with lemon or with some other food or drink high in Vitamin C. You can also avoid the problem if you drink green tea only between meals and not during meals. You can find out a bit more about this in our Green Tea Health Benefits article. If you drink about 3-4 cups of green tea per day you will lose about one quarter of a pound each week. If you want to lose a larger amount of weight, you’ll also need to adjust your diet and exercise regularly. I have been following the Atkins diet as prescribed by my M.D. for 5 years. It is a safe, effective diet. I also drink 3-4 Cups of Good Earth green tea lemongrass, along with 6-8 glasses of water each day. It is this eating lifestyle that has led me to lose 106 lbs, get off all cholesterol, blood pressure and diabetes medicine and be happy and healthy beginning the first 6 months I was living the Atkins way. I have not gained any of the weight back and have not had to use cholesterol, blood pressure or diabetes medicine since. My doctor has had more than 1500 patients in his 25 years of practice who have lost weight, successfully in this manner. So, enjoy your green tea & water, your high good protein, high good fat foods and enjoy life! Good for you Katrin! Those are very impressive results. Thank you for sharing your success — I’m sure it will help motivate others! I am 15 years old and I currently just started taking green tea. My mum brought me twinings pure green tea. Does it have the same effect as the green tea your writing about? The Twinings tea is a fine choice. It’s a good quality tea, and it will help you. Since you are 15, you should also be sure to read this previous reply to Pooja regarding green tea for teenagers. I have two questions regarding green tea. My first question is that, is it okay for teenagers to have 3-4 cups of green tea per day?? How many cups do you recommend that a teenager should have per day?? And my second question is that, my weight is 65kg and I want to get the perfect 45 or 50 kg; so how many cups of green tea should I drink per day if I want to lose weight in about 2-3 months?? Regarding green tea for teenagers, please see the previous reply to Pooja. Regarding your weight loss goal of losing 15 to 20kg in 2-3 months, you will not be able to do that just by drinking green tea. Drinking about 4 cups of green tea each day will help you lose about one half to one kilogram per month. Drinking more green tea will not help you lose weight any faster, and it might be unhealthy. To lose more weight, you also need to exercise regularly and improve your diet. A healthy goal is to try to lose one to two kilograms per month. Losing weight any more quickly can be unhealthy. Are we able to drink normal tea when we are using green tea? What is the quantity of tea for a cup? I am 30 years old.Can i have breakfast and green tea together or i should have 30 minute before breakfast. Neelam, you can drink the green tea before or during breakfast — whichever you prefer. The only with problem drinking it during mealtime is that the green tea (and any tea) may prevent your body from absorbing all the iron in your food. But you can eliminate this problem by adding some lemon to you tea or by eating foods with vitamin C, like oranges, kiwi, strawberries, or papaya. I’m 28 yrs old with two children. I have gained a lot and I have stones in my gallbladder. I take thyroid medicine, too. I have started drinking 8 glasses of green tea daily. Is it harmful for my liver and gallstones? Do lemme know proper use of green tea to help reduce my weight. Is green tea good for kids, too? For which age group is it suitable? Pooja, there is conflicting research regarding excessive amounts of green tea and liver damage. Some studies say there could be damage, while others say there is none. We generally recommend drinking 2-4 cups of green tea per day. That’s a safe amount that provides many health benefits. However, since you have several other conditions (including thyroid problems), you should really check with your doctor — he or she has the most knowledge of your full medical condition. Regarding kids, the only real concern is caffeine. Green tea has about half the caffeine of black tea and about one quarter the caffeine of coffee. Very young children should avoid caffeine and green tea. Small amounts are OK for older children, but too much caffeine can lead to problems with sleep, concentration, and behavior. You should limit older children to one or two cups of green tea. If you see any negative reactions, cut the green tea. Im from INDIA. And im 25 yrs old and weigh 87 kgs or 191 pounds. My goal is to reduce my weight to 75 kgs or 165 pounds. More over i have a tummy and i want a flat abs. I have started exercises from last week. I do cycling for 30-40 mins continuesly everyday in the morning. And weight lifting exercise for 30 – 40 mins. And i have started to drink 3 cups green tea every day. Could you please advice how long it would take for me to shed the 35 pounds. ? Karthik: You are off to a great start. Congratulations for starting such a thorough fitness program! I can’t tell you exactly how long it will take to lose 35 pounds. It depends on the difference between the amount of calories you burn and the amount of calories you eat. Each pound is 3,500 calories. So every time you burn 3,500 more calories than you eat, you will lose one pound. But please realize that it will take some time to lose 35 pounds. With hard work, you can safely lose about 1-3 pounds per week. Loosing weight any more rapidly will be both very difficult and possibly unhealthy. Sonali, you did the right thing by consulting a dietitian. The dietitian will be able to give you the best advice for your specific circumstances. Remember that green tea alone will only help you lose a few kg over the course of a year. But with your healthy diet and daily exercise, you will be on track to reduce your wait faster. i am a mother of a three. i drink 1 litre of green tea and 1 litre of tulsi green tea . can u tell me how much will i reduce in a month in kg plz. Nancy, unfortunately drinking green tea is not a magic formula for weight loss. It can help boost your metabolism, which will help you lose a little weight. But the green tea will only help you lose one or two kilograms over an entire year. If you want to lose a lot of weight, you will also need to exercise more and cut down the amount of calories that you eat. We should have green tea only with hot water??? Actually I prepare Green Tea with hot water in the morning for entire day. It becomes cool by afternoon. Can i get the same benefits with cool Green tea also??? Great question Kumar. You should get the same benefit whether you drink it hot or cold. I’m a mother of three and I used to weigh 240 about a year ago. Now I weigh 140 and all I drink is about 5 cups of tea a day. It really burns fat. Hello. Did you exercise a little or a lot? Did you still eat food you enjoy? And also did you drink the tea with meals? You should try to exercise as much as you can. 45 minutes each day is ideal for weight loss, but that’s not always possible. Just exercise as often and as much as you can. Can you eat food you enjoy? That depends on what you enjoy You should certainly try to make healthy food choices, especially avoiding sugar and processed grains. And you should watch your portion size! You can drink green tea with meals, but it can interfere with your ability to absorb iron and folic acid. So it’s best to drink it in between meals. There is some more info on this topic here: Health Benefits of Green Tea: When to Avoid Green Tea. Hi. Just want to know does green tea work if I add sugar for taste…Thank you. Thembeka, you can add sugar to the green tea an still get many health benefits. However, you will lose the weight loss benefit because the calories from the sugar will be more than the calories burned from the increase in metabolism. So, if you drink green tea with sugar, you may actually gain weight. I’ve also forgotten to ask, how many cups a day should I be drinking? Regarding brands, I don’t have any research on the effectiveness of different brands. I think that any brand is likely fine, as long as it’s not overly processed and does not contain any non-natural additives. I would avoid the powdered teas. Regarding brewing, you should boil the water first and then steep the teabags. Regarding the amount, you can drink 2-4 cups per day. But you should spread them out during the day. That’s because the tea contains caffeine. While a steady doss of caffeine is OK, a big caffeine spike is not very healthy. If you find the caffeine is disrupting your sleep, you might also want to avoid drinking it in the evening. This might sound like a stupid question, but do the brands of the teabags I use matter on the effectiveness? Also, I’m guessing using whole green tea leaves would increase the effectiveness, but would 2-3 cups of green tea from traditional teabags with like powdered tea (are those called tea shavings?) at least effective at all? Should I also, when brewing the tea, boil it as hot as possible to get the most out of the tea? I’m not that familiar with tea, but steeping the tea is when you leave the teabag in the water after turning off the stove, right? Should I also steep the teabag for long amounts for maximum effectiveness? Sorry about the amount of questions I’m asking. I have a big pot of green tea in my cupboard and only recently heard about the weight loss benefits. But the more I read the more I notice it’s not really a massive help for weight loss, but more to help with energy levels and feeling fresh for the day?? Sian, you are right. Regarding weight loss, green tea can help temporarily boost your metabolism. This helps you burn a few extra calories. But the amount is small — it will only help you lose 5 or 10 pounds over the course of an entire year. But since most people over 30 add 5 pounds to their weight every year, this can help. Every little bit counts! Soon to be 50 pounds lighter… Mei. Thanks for sharing Mei. Good luck with your 50 lb goal — I’m sure you can make it! Is it better to purchase the tea bags or to buy the chopped leaf and boil it? Manuel, either method works well. Boiling loose leaves directly in the pot will give you a more flavorful and stronger tea, but you will need some kind of apparatus to strain the tea to remove the leaves. Some options are basket filters, tea socks, tea balls, or a tea press. Rohit, I’m sorry, but we are in the United States and can’t advise you on purchases in India. You’ll have to check locally. I have started a weight loss website for individuals who have had great difficulty losing weight, and I wanted to back up the theory of the use of Green Tea! I drink it almost everyday, along with following a Healthy Eating plan that caused my weight loss and has keep it off now for more than two years. The plan I use revolves around “Food Combining” or “Trophology” and how to eat the foods you love, and lose weight FAST. It is based on biology and how our systems digest food. Again, I feel the Green Tea is a very important factor to your daily plan and it has properties that build up our immune systems and can keep us looking and feeling young and vibrant. Thanks Stephanie. I’m glad that you also find Green Tea to be a useful tool for losing weight! How quick is green tea in burning fat? Started drinking it last month,wana shed some weight for the Christmas Party!!! Rhonda, green tea is a great way to give your metabolism a little boost and increase the amount of calories that you burn each day. But you won’t notice much difference in time for the Xmas party. The boost will only help you to lose 1-2 pounds over the course of a year. Every little bit helps, but if you have a lot of weight to lose, you also need to include a regular exercise program and limit the total number of calories you eat. I am suffering from hypertension and high cholesterol because lack of alcohol intake. Is it good to take green tea for this kind of disease because lots of people had advised me for green tea. Please advice for the same issue. Manoj, I am sorry to hear of your health problems. Unfortunately, we can not offer medical advice for such serious conditions, since the answer is very dependent on knowing more medical details. I suggest you see your doctor, who can give you advice based on ALL your medical information. Sorry that we couldn’t be more helpful here. I so very much want to loose weight. I have been working out for over 4 months and my weight fluctuates between 218- 220. That is so depressing. I am going to try the green tea but what else can I do to move things along. I’m on a limited income so i cant afford a gym. workout at home doing cardio and weight lifting. I dont know what to do to make my weight go away. But to really lose weight, the only way is to burn more calories than you eat. So you need to make smart choices about what you eat and drink, and you need to limit your overall calorie intake. And you will need to keep up the cardio and weightlifting — it’s REALLY great that you are doing that. For some extra tips that might help, sign up for our newsletter and search through our site. Have you looked into intermittent fasting? It saves on food and works a charm. I went from 230 pounds down to 175 with intermittent fasting. Good luck I hope this helps. Thanks for the tip. And congrats on your weight loss success!